The Nairobi to Cape Town tour is basically the same as the tour from Cape to Nairobi. The big difference is the direction of course, but on this tour camping and accommodated clients will travel together the entire 41 days. 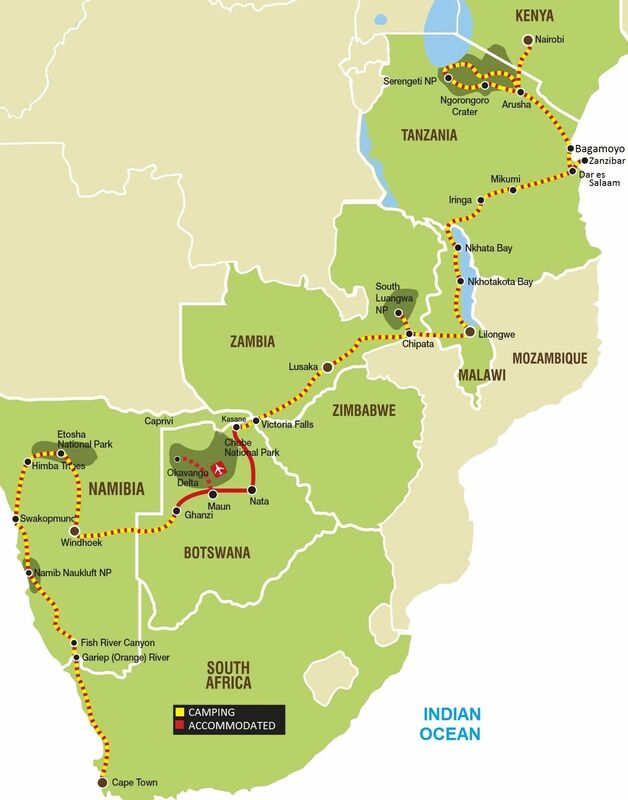 This overland adventure tour covers all the highlights of the 21 day East African Adventure (South) + all the highlights of the 20 day Vic Falls to Cape Town tour. 1. Accommodated (hotels/ lodges): Clients overnight in a comfortable twin rooms or permanent safari tents, mostly with en-suite bathrooms. See details below. 2. Camping: Clients mostly overnight in comfortable two-man dome tents, with built in mosquito nets and of course a mattress… and a couple of nights are upgraded to budget rooms. Click link for Camping option. We leave the hustle and bustle of Nairobi behind and travel south to the Tanzanian border. This epic 41 day adventure to Cape Town in South Africa has begun! After completing border formalities we continue to the busy town of Arusha, our base for the night. Northern Tanzania is home to the Serengeti, Ngorongoro and Kilimanjaro. Those who have purchased the optional Serengeti Excursion upgrade package will be briefed this evening by our local guide on what to prepare for the coming days. Please note:This morning, those guests who pre-purchased the Serengeti excursion upgrade will be collected and will be separated from the group for the next 4 days). See all the details in the 2019 Tour dossier, or click here. 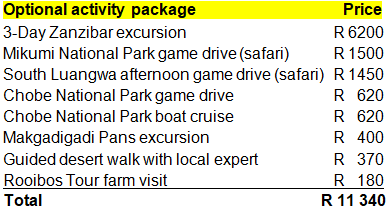 Please note:Clients who are not joining the Zanzibar Excursion will remain in Bagamoyo for the duration of the Zanzibar Excursion. Accommodation includes breakfast and dinner daily, but lunches are not included for the duration of the Zanzibar excursion. * Note:Those guests who have pre-purchased the Okavango upgrade package – will be transferred into the Delta today and will re-join the group after the Delta excursion. View all the details here. We start early this morning as we continue west and cross the border into Namibia, travelling onwards to the capital city of Windhoek. Upon arrival in Windhoek, we will take a short walk through the city centre and have the opportunity to view some its better known landmarks.